This is the 8th consecutive year that 6-12 Dept. Chairperson John Kotch has written and received grants (each grant ranges between $3000-$5000) from Cell Signaling Technologies, an applied systems biology research company based in Danvers. The science department now has a complete classroom set of iPads for our students with many apps and programs that are used for all of the classes; 2 classroom sets of Student Response Systems; numerous interface GLX probeware devices and a variety of sensors such as: carbon dioxide; dissolved oxygen; temperature; pH; motion; force; velocity; colorimeter, etc. to be used in laboratory investigations. This grant allowed us to purchase DNA Electrophoresis Instructional Lab Sets. These will provide our students with state of the art lab experiences. One of our grants was co-written by our Biology teacher Alison Dolan and John Kotch and was for $3385 to fund the purchase of mini-PCR machines with learning kits. These kits will allow our AP Biology and other life science students to work with state-of-the-art technology for lab investigations at the highest level. 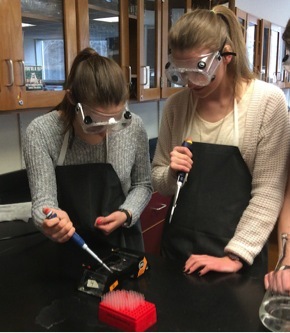 We also purchased Mini-PCR machines that were used for lab investigations with our AP Biology students as they were using this cutting-edge technology for the first time. Another grant allowed us to secure more cutting edge technology kits in the form of Biofuel Enzyme Reactions Kits; ELISA Immuno Explorer Kits to to enzyme-linked immunosorbent assays; PV92 92 PCR Informatics Kits for forensics investigations and and a Crime Scene Investigating Kit using DNA Electrophoresis. This grant, wrtitten by Deb Clapp ( Anatomy-Physiology and Forensics teacher) was awarded by the HW Edfund. Thank you Edfund! The approximately $3000 grant allows our forensics students to use this state of the art comparison microscope for analysis of hair and fiber evidence, pollen and soil evidence, and bullet shell casing evidence to help them in their “who dunnit” evaluations. Also, paint chips and botanical evidence could be evaluated in the future! This is the same type of equipment utilized by State Crime Labs and offers a unique opportunity for our students as they can now utilize the same equipment as crime specialists. Science From Scientists For Miles River Science Students! We are excited to announce that we will be bringing in “Science from Scientists” next year (2015-16) to our Miles River School science classes for all grades 6th-8th, thanks to a $15,000 Edfund grant written by John Kotch, the 6-12 Science and Engineering Curriculum Leader. This organization brings in real-world scientists on an every-other-week basis for hands-on, laboratory activities in a wide-range of science topics that are aligned with both MA State Frameworks and Next Generation Science Standards. Our goal is, as SfS states, to improve the “Aptitude and Attitude” of our young students toward STEM education by exposing our students to a broader range of materials and lessons. A CNC plasma cutter is a state-of-the-art computer numerical controlled robot, which moves an arm that holds a plasma torch on the X,Y, and Z-axis. As the arm moves, it cuts designated shapes or designs out of metal (typically steel*). The purpose of bringing this setup into the school is to give the students more real-world learning opportunities through the use of a technology that is used by professionals in fields such as engineering, technology, art, and more. Tate Shippen (Math Dept.) and Jeff Walsh (Engineering teacher) secured a $20,000 plus grant for the purchase of several 3D printers and a set of powerful laptops plus 3D Graphing software to drive them. "This is a revolutionary addition to the school’s engineering capability, truly now our students will be able to boldly go where no-one has gone before. Tate and Jeff have shown great leadership, vision, management skills and tenacity to bring this about, thank you both!" The Science Department has added to last year's grant from the Hamilton-Wenham Edfund to purchase 7 Exo Lab microscope cameras by now including 15 more Exo cameras for a classroom set of 22. These devices attach directly to the microscope and then project the image onto an iPad for better viewing, editing and photographing. Students have have used these to create dissection guides, produce lab reports with annotated micrographs and in student collaboration projects during microscopic lab work. 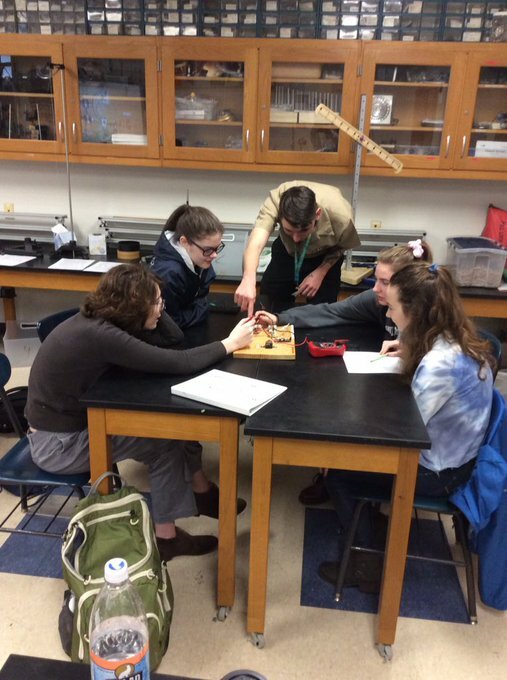 In an ongoing effort to continue to bring real-world science into our classroom and school, the Science & Engineering Department invited engineering and other experts from the Portsmouth Naval Shipyard, which specializes in working on the navy’s nuclear submarines, for a full day of presentations, activities and lectures to our entire 10th grade class. This was all arranged by Chemistry teacher Regina O’Neil and was the 5th year of what we hope to continue as an annual event. Joe Mansell, a radioloic technologies program director from North Shore Community College has worked for years at Beverly Hospital and now is undertaking some radiology teaching! He will discuss various medical imaging techniques, a few case studies, and how to follow this career path. Micheal O’Donnell –trauma nurse at Mass General Hospital spoke with our Anatomy classes and has graciously offered students the opportunity to job shadow! Michael is also on the "Save My Life-Boston Trauma" unscripted medical show on ABC. What a great opportunity for our HW students! Dermatologist; Radiologist; Oncologist; State Medical Examiner; Engineer of Prosthetics; Crime Scene Lab specialist and a Burn Specialist, to name a few. Mrs. Clapp has also arranged for our school to borrow, on an annual basis, the "Skin Scope" from the Melanoma Foundation of New England. This scope allows students to view their skin to check for skin damage and is used in conjunction with our Anatomy lessons on the skin so that our students are educated as to how to best protect themselves from causing any skin damage now or in the future. 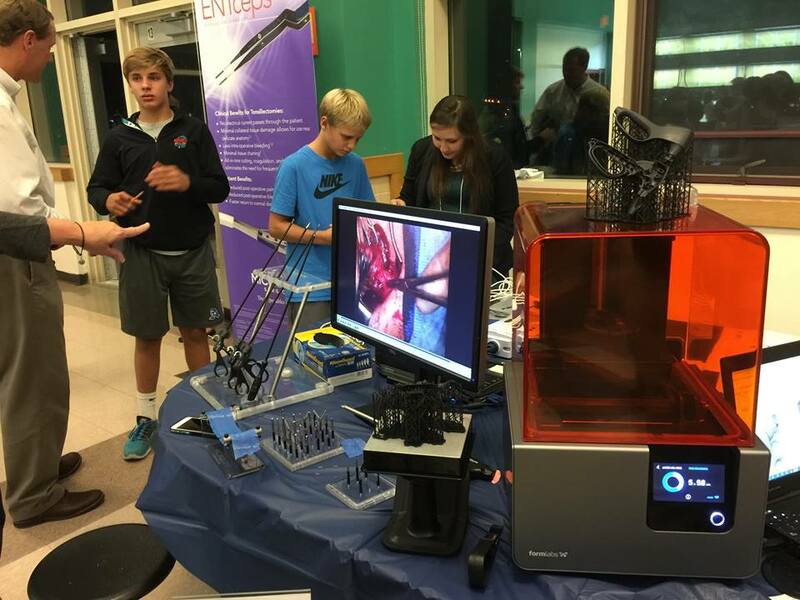 Mr. Kotch, the 6-12 Science Department Chairperson, in collaboratin with parent Lorraine Miller,organized a STEM Night for our Hamilton-Wenham community of parents and students. The evening was a tremendous success with over 500 people attending! We were able to have local businesses, education institutions and companies showcase their products, services, ideas and inventions and share their passion and knowledge for Science, Technology, Engineering and Math. We will also had students and faculty of HW demonstrate the use of various technologies found within our school. Over 40 presenters were involved including: iRobot; General Electric Jet Engines; Boston University Women in Chemistry, Microline Surgical with engineering design and 3D Printers in action; Geo-Orbital with their electric bike design; green screen technology; New England Biolabs and local colleges, plus many more! Our CP Physics students have worked in a collaboration project with Project Adventure to design elements following PA's mission statement. This project based experience requires various criterion: physics concepts involved; schematic designs; materials and labor costs; handicap access; PA requirements. Additionally, the Engineering Dept. was involved (teacher Jeff Walsh) as students partnered with CAD students to design and 3D print their elements and also partnered with Art students (teacher Courtney Cooney) to assist in the creative design of their 3D models. Final projects are reviewed by a panel of Project Adventure staff to critique the work by the students. Department Chairperson John Kotch and Technology/Engineering teacher Jeff Walsh have met and collaborated with Kim Claire from the Hamilton-Wenham Regional Public Library on a grant proposal called, “Science is Everywhere” grant that would provide a hands-on, activity-based series for students in the 5th-8th grade range that would take place at the library and is being written by Kim. Jeff will now be the person who will provide a series of 8 hands-on activities, which will include such areas as robotics, CAD design, bridge construction and 3D printing, to name a few examples. Mr. Gokhfeld is teaching AP Physics, Honors Physics and CP Physics.